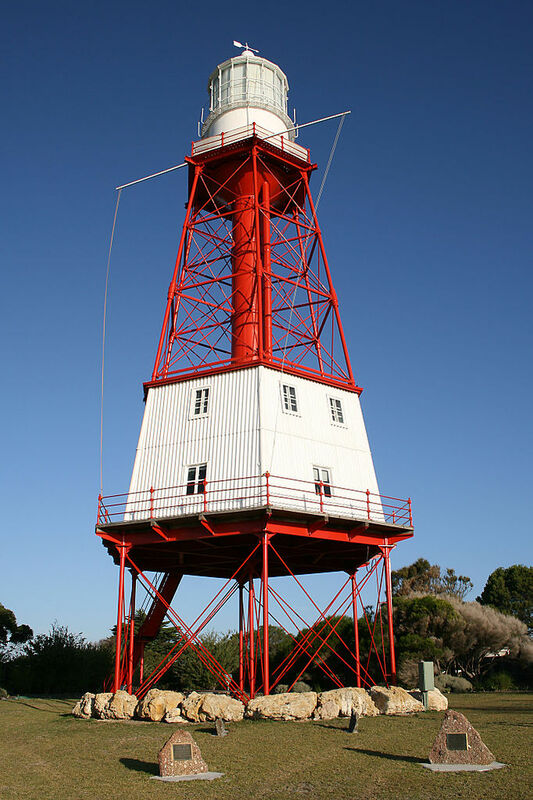 Cape Jaffa Lighthouse | Lighthouses of Australia Inc. Originally built on Margaret Brock Reef off Cape Jaffa, at the end of its service, the screw pile lighthouse was dismantled and reassembled at Kingston. Established in 1872 on Margaret Brock Reef, the Cape Jaffa Lighthouse was built to protect ships from the treacherous currents that had seen the demise of many ships in the area. The original multi-wick oil burner was replaced by a pressurised kerosene burner in 1909. This lighting apparatus was turned off in 1973 and is believed to have been the last of its type to operate in Australia. This type of lighthouse is known as “Wells Screw Pile” and was selected for this location because the narrow wrought iron piles offered the most resistance to the heavy seas that break across the reef. Extreme difficulties were encountered during its construction which took 3 years instead of the proposed 1 year. Apparently when the site was first chosen the sea and weather was unusually calm. When it came time to construct the lighthouse sea were wild and the weather rough. Early construction was washed away and sometimes the contractors could not go out for days. Another story from Jack Loney’s book of Shipwrecks on the South Australian Coast tells of some castaways reaching the lighthouse only to find it was unmanned. On reporting this the body of one of the lightkeepers was found and the other was never recovered. It was known that they got on well and were very keen on fishing. Jack Loney states that it was this tragedy the led to the decision to close the lighthouse. On 1 April 1973, a new lighthouse at Robe was switched on and the Cape Jaffa light was extinguished. A low powered temporary beacon was attached to the tower. The then Department of Transport had decided to dismantle the lighthouse and replace it with a beacon on the platform. The National Trust of South Australia (Kingston Branch) successfully lobbied for the lighthouse to be re-erected at Kingston where it could be preserved as a museum to show what life was like on the platform. Dismantling began in February 1974 and was complete by March 1975. The reconstruction began at Kingston in June 1975 and was completed in December 1976. The Lighthouse was officially handed over to the National Trust of South Australia (Kingston Branch) on January 1976 and now operates as a museum. A small museum is in the tower.